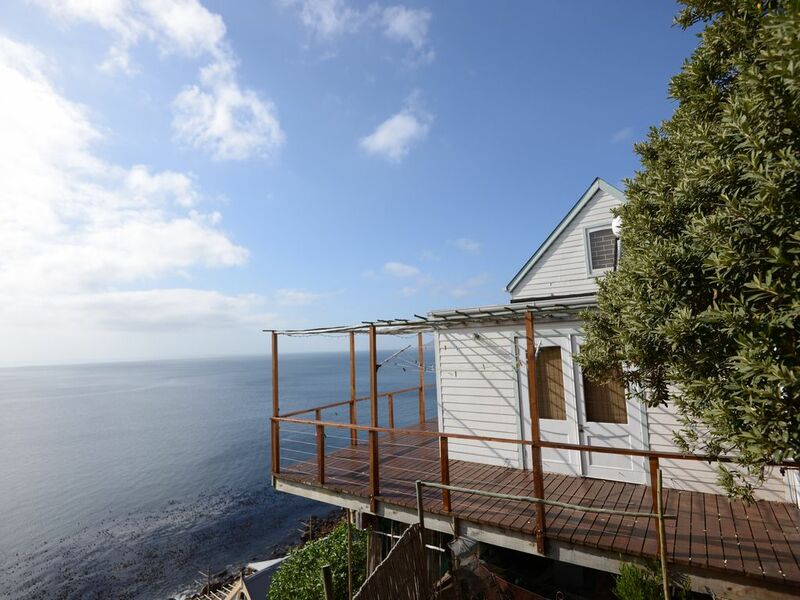 Nestled on the coastal cliffs of Fish Hoek and surrounded by a natural garden the cottage offers breath-taking views across the bay and often you see dolphins and whales frolicking in the waves just below the house. Fall asleep to the sound of crashing waves and feel completely away from it all in nature while still being in easy reach of all that Cape Town has to offer. The cottage is within an easy walk to Fish Hoek beach with its crystal clear and warmest water in Cape Town, you can reach central Cape Town in 30 min by car or a picturesque ride in the local train, passing the other coastal towns. The main bedroom with sea views opens with French doors onto the deck and has a queen-sized bed. The second bedroom, with two single beds, is located in the loft of the living room and is reached via a ladder. There is one bathroom with a shower. There are BBQ (Braai) facilities in the garden for those summer nights and a cast iron stove for those cuddle up winter nights. Parking is just outside the property in a secure cul-de-sac. Your host Uta is happy to help with any advice on the many choices of restaurants, local markets and events in the area or practicalities such as bicycle rent and outdoor activities. We do generally only accommodate 4 people, but if you are staying longer than five days we can provide an extra mattress. Also, just next to this cottage there is a smaller cottage of the same style that can accommodate another two people.